Brian has been wanting to try Tommy’s Brick Oven Pizza for a while now, but some how Epik Burger keeps interfering… (I dunno… don’t look at me…. ) The other night he was craving pizza and I’d had my Epik Burger fix the day before so I couldn’t really say anything. Tommy’s had really good reviews on Find Me Gluten Free. Why haven’t we been eating here all along?! The pizza was fabulous! No, seriously… not ‘good for gluten free,’ but GOOD… actually good. Best of all, the Gluten Free-ness of the pizza seemed to be an honest concern for the staff. Out front there’s a guy tossing pizza dough in the air and stretching crust onto pans….. and that just looks like Gluten Doom…. but then I saw one of the other guys dissapear into a different room and come back with the prepared GF pizza on a sheet of parchment paper. The pizza was transfered from the paper into the brick oven…. completely avoiding the gluten-ed crust tossing area. According to their menu all the toppings are Gluten Free except for the meatballs. Mom and I decided to share a pizza. They’re 12″ and that’s plenty for the two of us. This pesto based pie is topped with Portabella and button mushroom slices, and lightly topped with mozzarella, then dusted with Romano cheese for the finishing touch. A ‘World-Class’ Pie, for our local ‘World-Class’ Daytona Racing team: Pepperoni, Sausage, Bacon, and Ham. A True Champion! Brian was right…. and now I’m addicted to Tommy’s pizza. We went back again a few nights later. This time I wanted to try a pizza with the tomato sauce instead of the Basil Pesto…. Brian has already settled on his favorite and he went with the Brumos (59) Race Pie again. This time Mom and I split the Jack Murray Pie. Everyone loved Tommy’s Uncle Jack, and he loved it loaded! Here’s his favorite with Pepperoni, Sausage, Mushrooms, Green Peppers, Onions, Olives, and Bacon. I’m not sure which was my favorite…. both were really good. I’m thinking next time I’ll tell Mom to order the Funghi Pie and Brian to order the Brumos Racer Pie and then I’ll steal pieces from them both! I was craving nachos the other night. Yes, again. There’s nothing wrong with nachos every night! But of course, we didn’t stop there. I decide to go with tacos…. 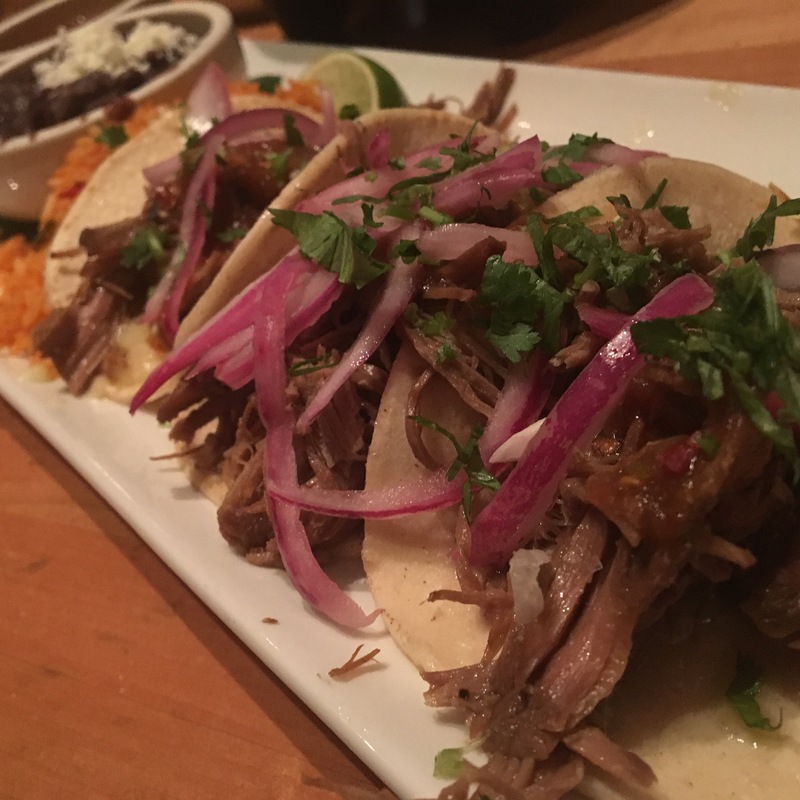 ’cause… tacos! Right?! The tacos were good… colorful, flavorful…. but the meats were somewhat dry. The brisket was difficult to bite apart and I ended up using my fork and knife to eat it. The Mahi Mahi was better, but still on the drier side. The rice was delicious and the beans… which I almost never bother with were actually really good. I’m hoping that we just caught the cook on a bad night… all the flavors were there… the meat was just too dry. The Top Shelf Guacamole was well worth the visit and given my nacho addiction, I’ll be back for another bowl before too long. 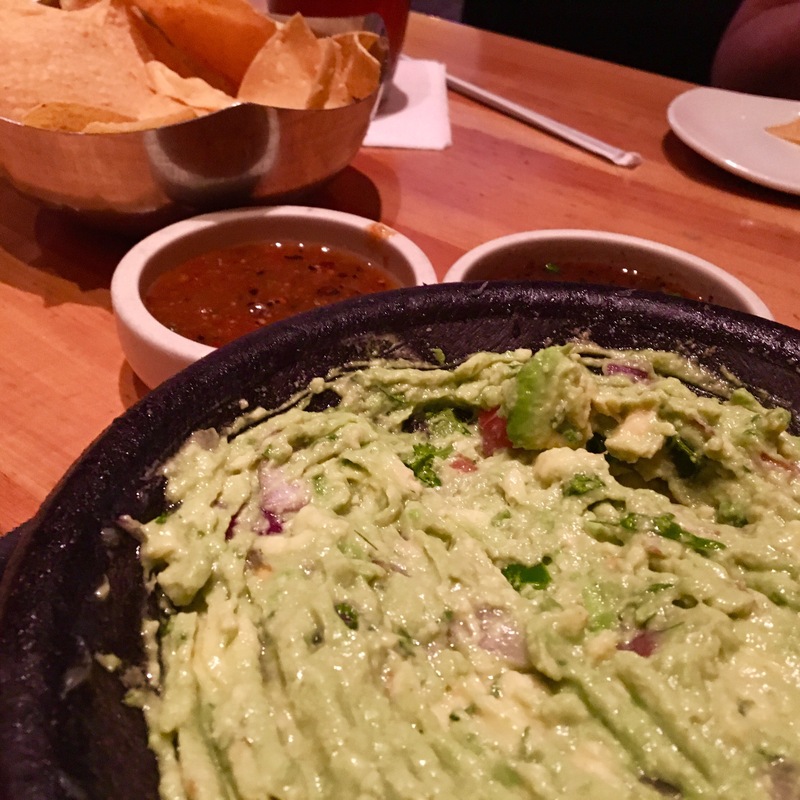 At the moment Casa Maya is still my favorite, for tacos, but Cantina Laredo is the winner in Nachos Chips & Guac. Last weekend Brian and I popped over to Disney World….. OMG! That still sounds so crazy! We just ‘popped’ over to Disney for the weekend…. ’cause we can do that now, ya know…. since we live in FLORIDA! As soon as we had our Florida drivers licenses we got our Disney FL Resident Annual Passes. I was not a fan of Disney as a kid, but after we went to the Osborne Festival of Lights with my in-laws one year, I was hooked. Disney is SO wasted on the little humans. 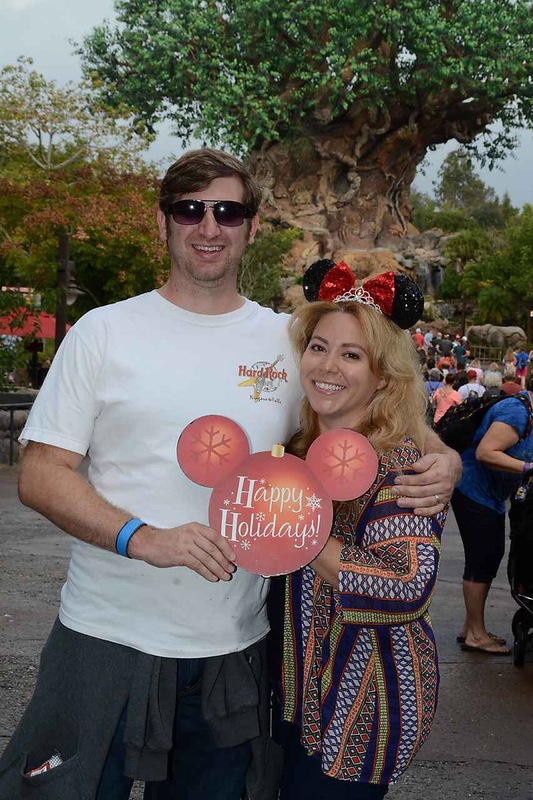 Brian and I planned to hit The Magic Kingdom, Animal Kingdom and Epcot this time… Hollywood Studios has a bunch of construction happening and Mom kept asking ‘How long are you going to be gone?’ So we figured three days would be plenty to start. 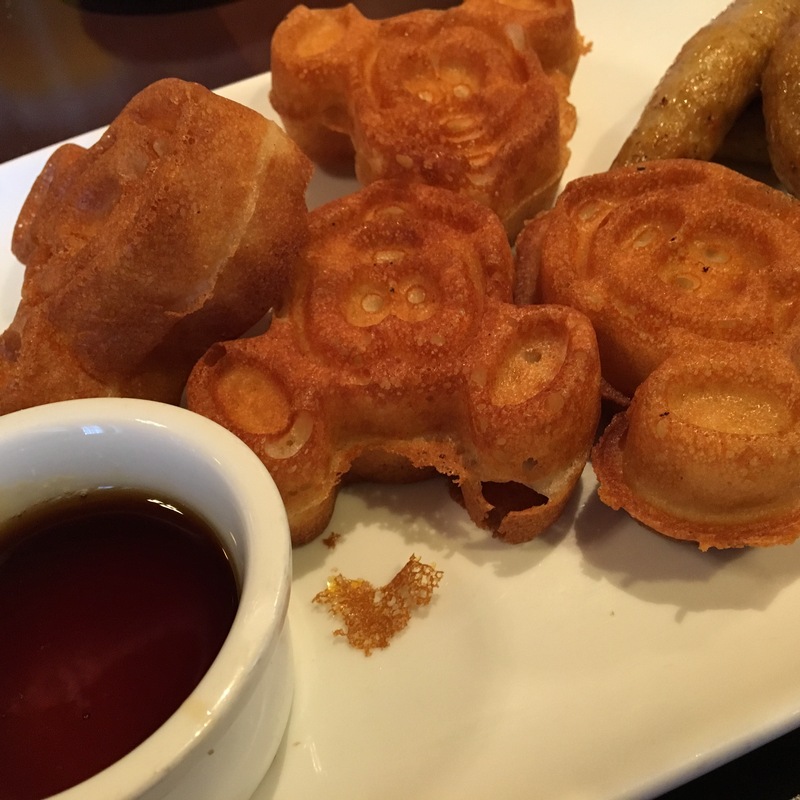 One of our favorite things (on our very long list) to do at Disney is EAT! Disney has some really good restaurants….especially in Epcot. Now if you’re wrinkling your nose at me right now then you’re probably thinking about the quick-serve places…. like Pizza Planet and such…. while those places aren’t bad…. I’m actually talking abut the REAL restaurants. Chefs Du France and Yack & Yeti… places where you go in and sit and a person comes to your table and asks your order. I have never once been concerned about the safety of my food in Disney… and I’ve never gotten sick. It’s amazing the number of allergies they can work around. You can always ask to speak to one of the chefs. So I was totally excited to go to Disney and EAT my way through the three parks. Calories don’t count in Disney. Last year Brian and I had breakfast at Trattoria al Forno on Disney’s Boardwalk. I ordered the Gluten Free Mickey Waffles that I’d heard all my favorite GF Disney Bloggers rave about. They were the best waffles that I’ve ever had… gf or otherwise. (That’s a glob of Heaven in the center there… aka Mascarpone with cinnamon and sugar). 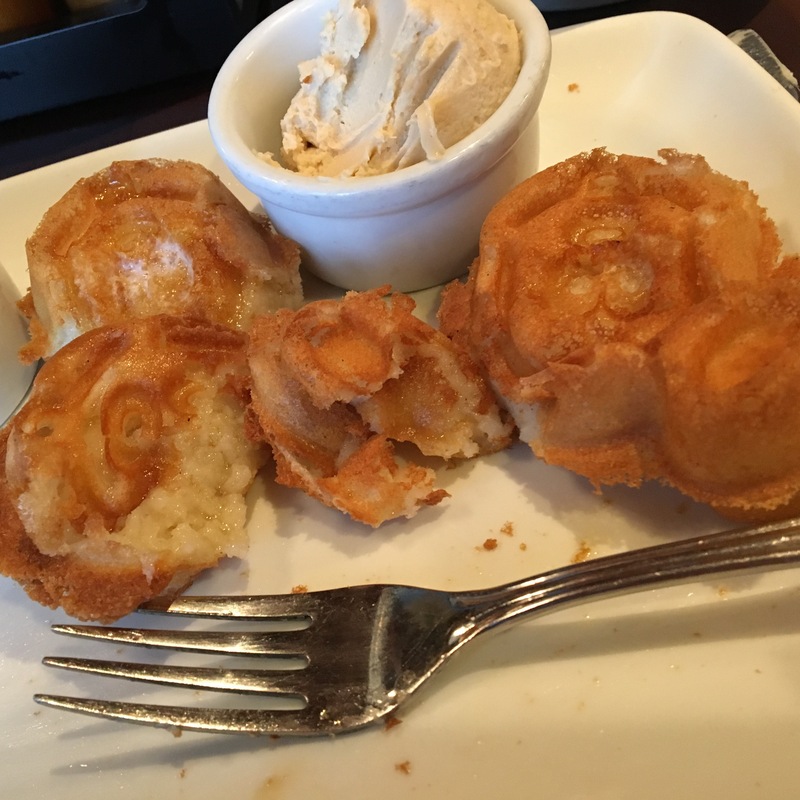 So this year I was totally wound about getting more Mouse Waffles… as I like to call them…. 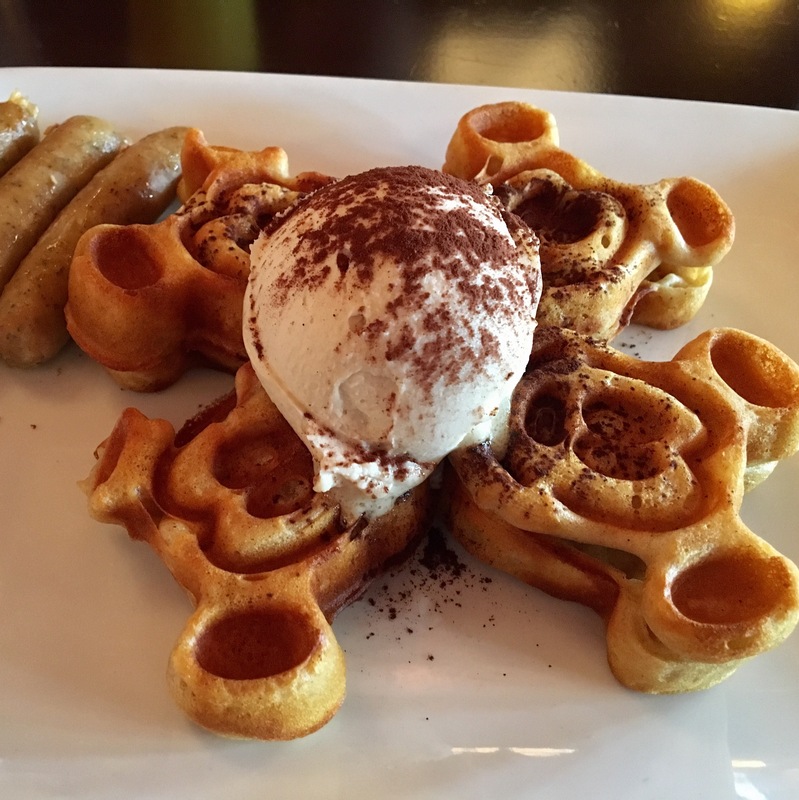 And then I sliced into my much anticipated, dreamed about waffles…. and they were gummy in the center! Crisp on the outside… gummy in the center. I sent them back and the manager brought me a bowl of fresh fruit while I waited for a new batch of waffles to be made. The second batch was gummy too. I gave up. Brian had already finished his meal and I’d eaten the bowl of fruit while I’d been waiting…. a third try wasn’t going to make anything better. Their recipe had obviously changed. After our visit last year I’d done some Googling and read that Disney used Cup4Cup Waffle mix for their waffles. I can’t remember where I read that… but I started using Cup4Cup to make my waffles at home and they tasted pretty much like I remembered Disney’s waffles. The Cup4Cup website has several different waffle recipes, but I use their pancake recipe. At this point I can’t remember why I started using the pancake recipe instead of the waffle recipe… but I like the way they turn out and I think they taste quite a bit like the Disney waffles that I remember. 1. Preheat griddle over medium heat. 2. Combine flour, sugar, baking powder, baking soda and salt together in a bowl. 3. Whisk in milk, egg and canola oil until there are no lumps. Batter will be thick. 4. Spoon pancake batter onto preheated griddle. Flip when bubbles appear, cook on opposite side until golden brown. We asked for a Gluten Free menu before we were seated and it took them a bit to find one…. it had gotten mixed in with the other menus… but they weren’t at all perturbed by the request. The GF menu was extensive and clearly marked and the waitress was helpful with suggestions and clarifications. Brian ordered a huge bowl of Fried Rice…. most places use soy sauce in their fried rice, so he doesn’t get to have it often. The Royal Dish was delicious. It’s a good thing that Mom and I decided to share because I’d have been compelled to eat it all….. and I might have exploded in the attempt. The GF white sauce (used instead of the usual brown sauce) was light and flavorful. The vegetables were plentiful and cooked perfectly…. the meats… tender and delicious. The fried rice (served as a side with the Royal Dish) was quite good too…. light and flavorful. The Spring Rolls were just so-so… they could have used a bit more flavor… maybe a bit of mint? And the shredded lettuce was difficult to keep from falling out of the wrapper. The Hoisin sauce was yummy though. I was very pleased with the Rice Bowl… even Brian admitted that it was a good find… ha! Mom and I ventured out into our new world all by ourselves last week. I was ridiculously proud of myself for navigating in a completely new city…with Google’s help, of course. I used to live just south of the St Louis City/County area all my life and practically refused to drive anywhere in the city limits….. maybe the Zoo… or the Botanical Gardens… those two places didn’t freak me out to much, but driving nearly anywhere else in STL gave me fits. Jacksonville, FL is so so so soooo much more laid back…. the roads make more sense…. people are a thousand times nicer….I’m just loving it here! Mom and I went out for massages and then Brian met us for lunch at TacoLu. TacoLu had good reviews on Find Me Gluten Free and I’m almost positive that our FL realtor had recommended it to us…. I think. So, I’m trying to be a bit more sensible with my portions…. trying…. I ordered two tacos and no sides…. and I tried to stay out of the chips and salsa. Spicy, Asian-style fried shrimp served on cabbage with chipotle crema and finished with a sprinkle of scallions for a dash of color! Served on a soft flour tortilla. We can add a little Sriracha for a spicy kick! No way did we make this recipe up, but we own it, now! Pork braised in a mix of Coca Cola and Orange Juice. It’s a crazy combo–but it WORKS. This pork melts Melts in your mouth!! Served on a flour tortilla with Monterrey Jack cheese, fresh cilantro and onion. The tacos were good, the salsa okay…. the decor was fun…. very ‘Día de Muertos’ kind of festive. The staff was great about reassuring us and most importantly, we felt just fine after we ate. For tacos I liked Casa Maya better, but TacoLu was really good a second. 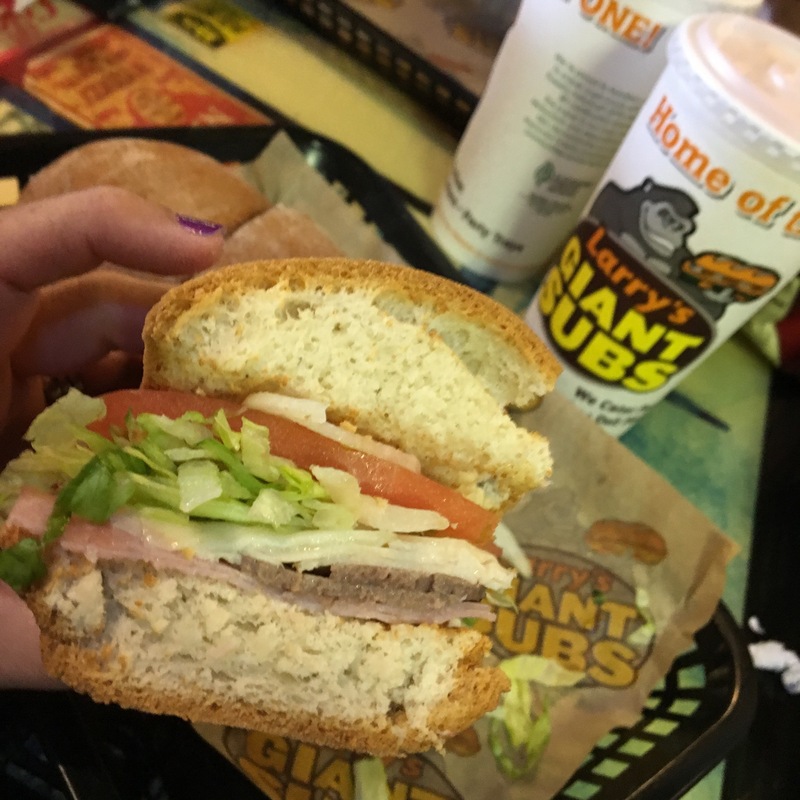 We stumbled across Larry’s Giant Subs with the help of the Find Me Gluten Free app the last time we were in Florida. 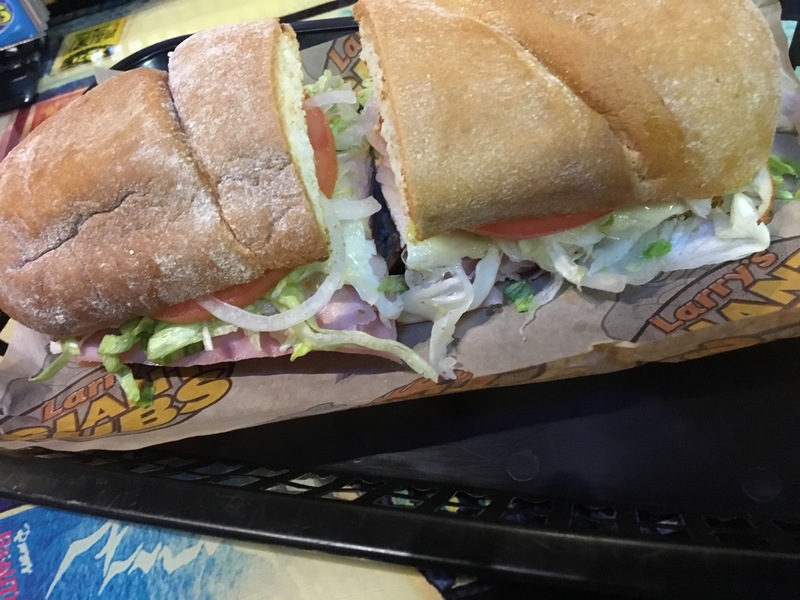 Since our move to Florida Larry’s has quickly become a favorite. I’ve been to three different Larry’s locations and each one has been great about reassuring us of the gluten-less-ness of our sandwiches. The first time they handed me my sandwich I thought they’d made a mistake and given me ‘real’ bread. I tried to hand it back, but the lady just laughed and said it really was their gluten free bread. It’s really good GF bread… fluffy with a nice flavor, and not crumbly or grainy like some GF breads. Like most sub sandwich breads, it’s still more bread than I want/need and I tend to yank hunks off and discard them. Mom liked the GF wrap… I need to try that next time. She said the flavor was good and it seemed to hold up nicely…’bendy’ would be the technical term, I suppose. They could be a little more generous with the meat on the deli sandwiches, but the chicken breast sandwiches are just the right amount. All in all, I love that sub sandwiches are available to me again. Few GF carry out options travel well…. It’s nice being able to pick something up quickly and take it home or to the beach… wherever.